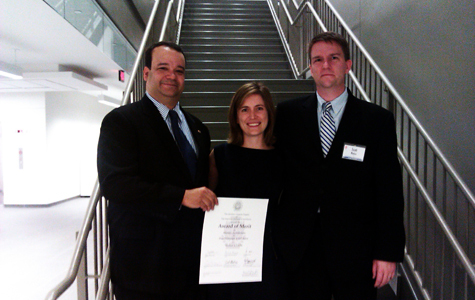 Ralph Cunningham, FAIA and Sarah Shipp, AIA with Scott Matties, AIA, LEED-AP. Cunningham | Quill Architects attended the AIA Northern Virginia Design Awards Gala last Saturday night at the Founder’s Hall building on the George Mason University campus in Arlington, Virginia. Emceed by one of our Principals, Mr. Scott Matties, AIA, LEED-AP, the evening’s event was filled with tastings of local wines paired with food from Lyon Hall. At the end of the night, CQA received its sixth AIA Award for Mother & Child. The Merit Award honors excellence in Historic Architecture. For more information on Mother & Child, please visit Cunningham | Quill Architects.